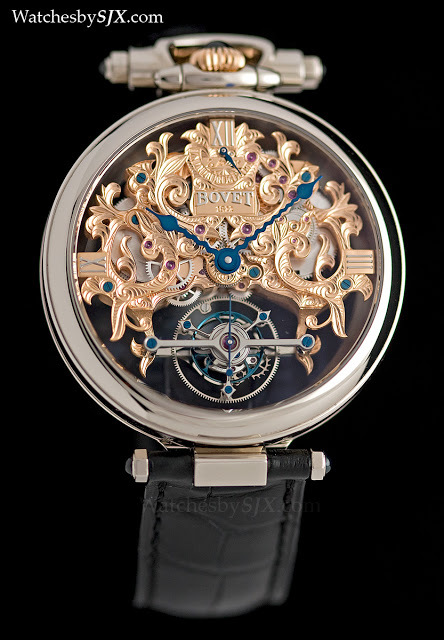 Executed in the ornate style characteristic of Bovet, Fleurier Amadeo 7-day Skeleton Tourbillon is the brand’s first skeleton tourbillon, featuring a double face, as well as the trademark Bovet convertible case. 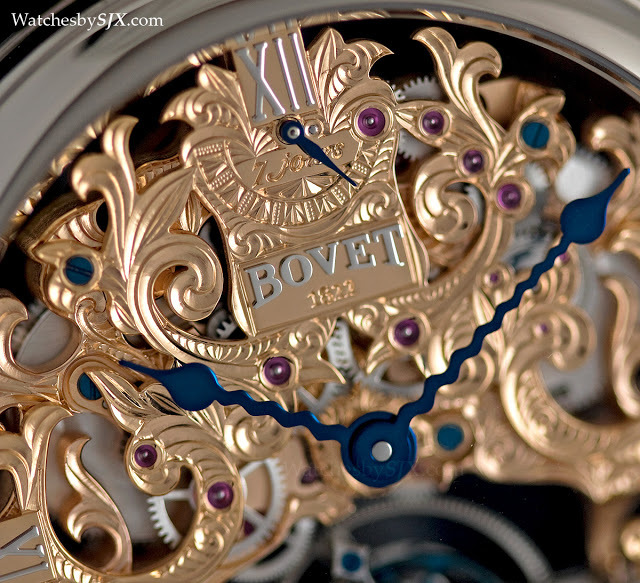 Bovet watches are finely made, elaborately decorated and expensive looking. 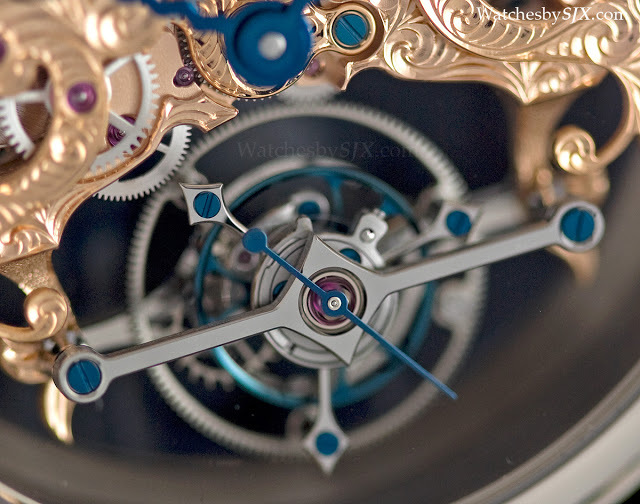 Launched just earlier this year, the Fleurier Amadeo 7-day Skeleton Tourbillon exemplifies that philosophy. 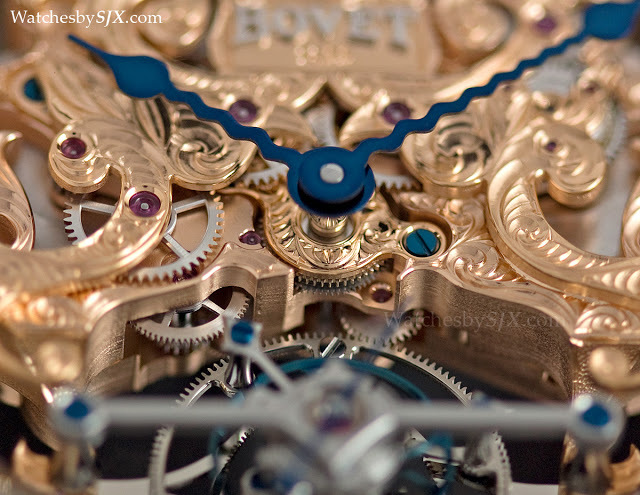 Like several other Bovet watches, the Fleurier Amadeo Skeleton Tourbillon has twin faces, each with its own set of hands; though both sets of hands tell the same time. 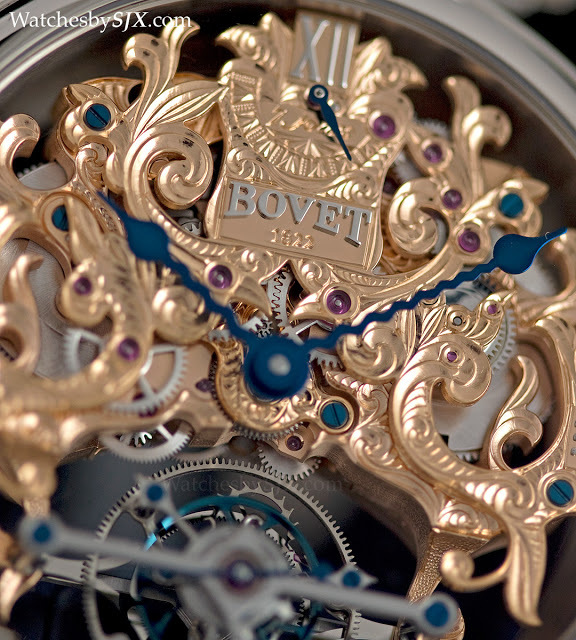 The more subtle side has a black guilloche dial above the highly engraved movement. 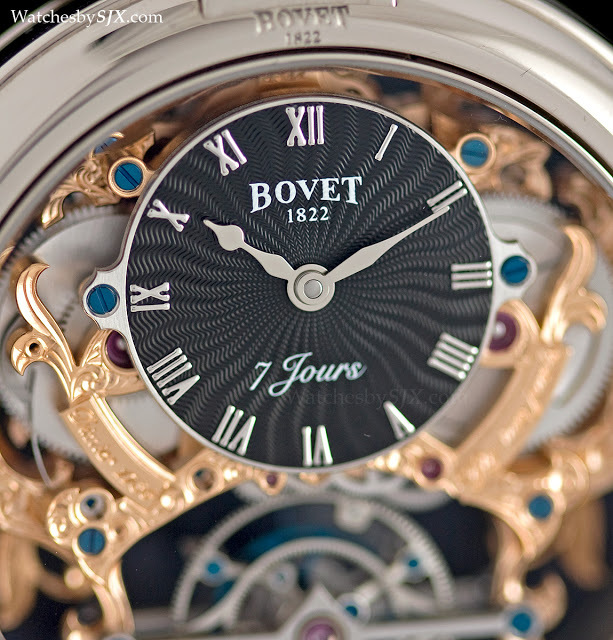 Fleurisanne engraving, a style of relief engraving from the town Fleurier where Bovet is based, decorates the plate under and around the dial. 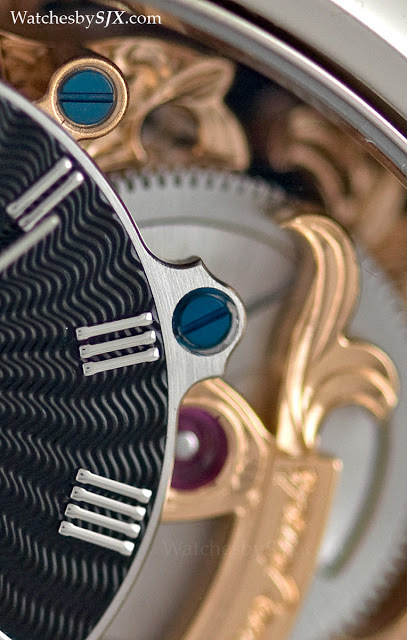 A simple detail that is almost lost amidst the engraving is the beautifully bevelled steel chapter ring securing the dial. 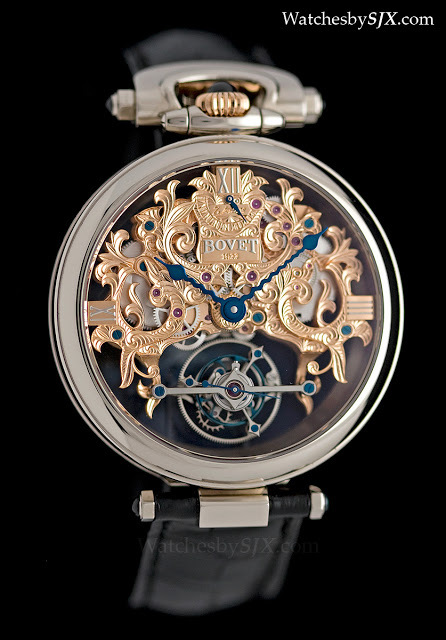 But it is on the other face where the engraver, who is no doubt talented, lets his talents run wild. Exposed in its full glory, the plate is covered in a skilfully executed floral motif, with blued steel serpentine hands for the time. 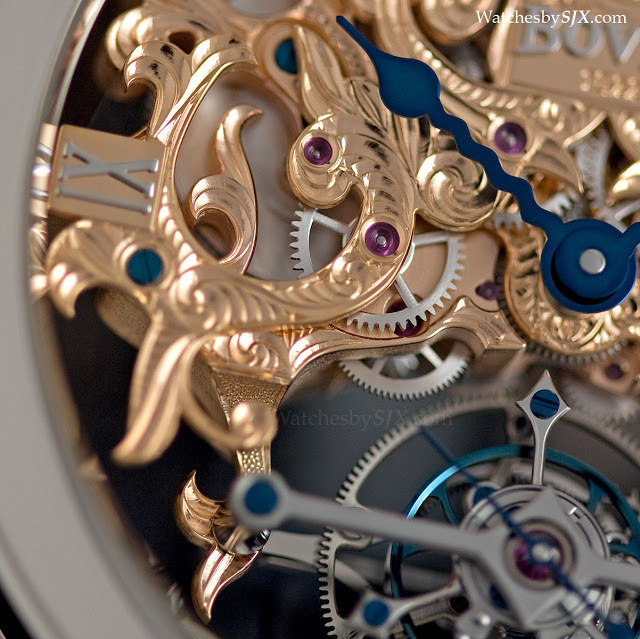 Aesthetic preferences aside – there is an ever so slight nouveau riche feel to this watch – the movement deserves high marks for the detail lavished on its decoration. 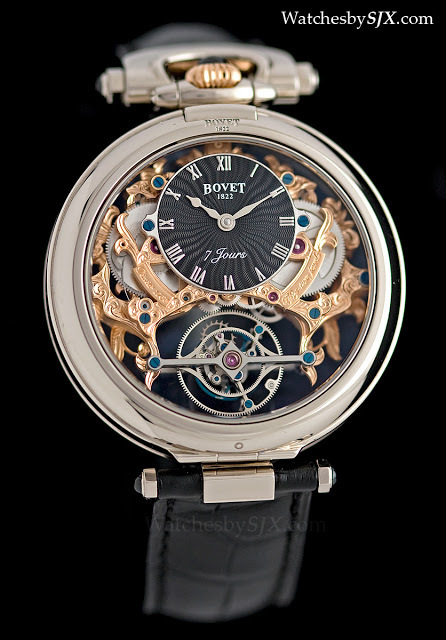 Made by Bovet’s sister company Dimier 1738 (formerly STT or Progress Watch), the movement is hand-wound and has a seven day power reserve. 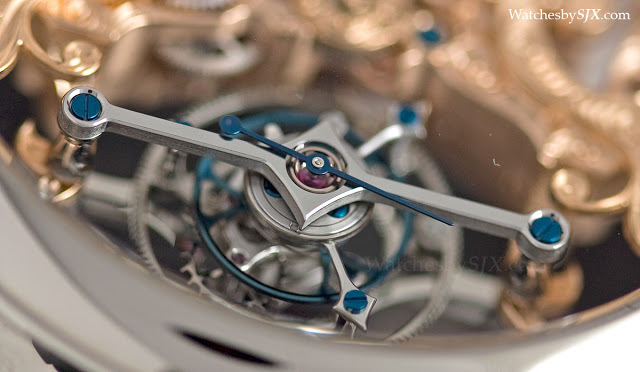 It has a three-quarter plate construction, on both sides, with the tourbillon visible at six. 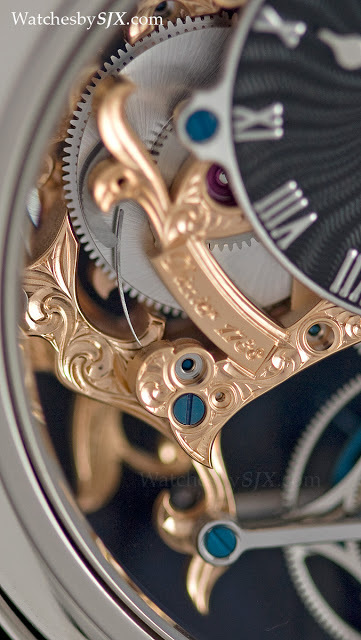 Held up by a flat, black-polished steel bridge with angled edges, the tourbillon is almost incongruous in its simplicity.